NEW YORK (Scrap Register): United States scrap gold prices continued to fall on Monday, while gold futures prices at New York Mercantile Exchange pared much of their earlier losses on Monday following their biggest weekly lashing in over three years, but prices still finished at their lowest levels in more than five months. The major gold scrap commodities on the Scrap Register Price Index traded lower on Monday. The 9ct hallmarked gold scrap prices declined by 1.9% to $441.447 an ounce and 14ct hallmarked gold scrap prices traded lower to $688.657 an ounce. The 18ct hallmarked gold scrap and 22ct hallmarked gold scrap prices also down at $882.894 ounce and $1078.308 an ounce respectively. 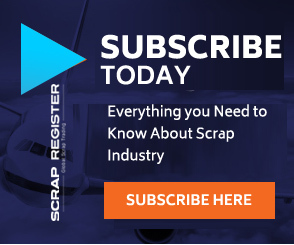 According to Scrap Register Price Index, the 9ct non-hallmarked gold scrap prices fell to $417.554 an ounce and 14ct non-hallmarked gold scrap prices down to $651.385 an ounce on Monday. The 18ct non-hallmarked gold scrap and 22ct non-hallmarked gold scrap prices are also traded slightly lower at $835.108 an ounce and $1019.946 an ounce respectively. The most active December gold contract on the COMEX division of the New York Mercantile Exchange down by $2.60 to $1,221.70 an ounce on Monday. It had dropped by as much as 1% to trade as low as $1,211, but also tapped a high of $1,230.90. The dollar rose to a nine-month high as the risk of faster domestic inflation and wider budget deficits sent Treasury yields ever higher. The market is also betting on the Federal Reserve raising interest rates more quickly.